New to the Roleplaying Forums? If you guys are so worried about what's going on being canonically possible then why is someone RPing Brolof? Aside from that there's no reason to assume that all the various plot threads floating around are a single continuity. In fact, given the subject matter of some of them that's pretty much impossible. Things are already a bit of a jumbled mess. But I suppose that's to be expected given how young this growing RP community is. 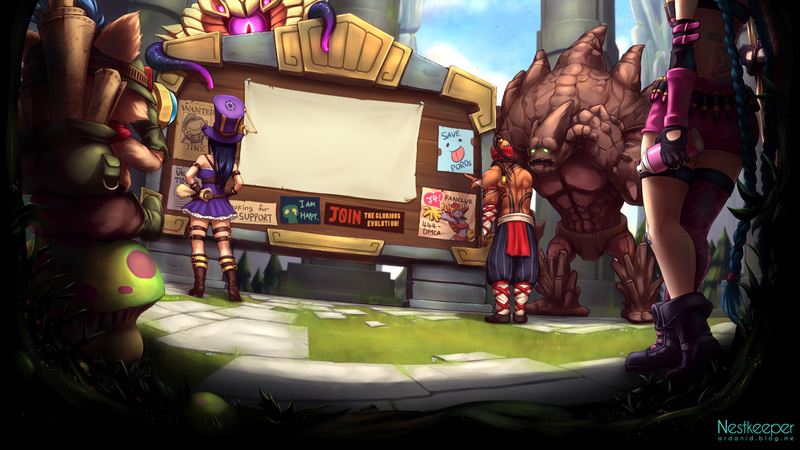 Still, though, do you really want to see a dozen Teemos, Wukongs, Master Yis, Jax's, Shyvanas, Katarinas, etc. roaming around this forum? Only if they speak in bold for emphasis! I think it's a lot more interesting for people to make Original Characters than it is to snag someone else's concept. And honestly it's a lot easier, too. People who use an existing character tend to be held to a higher standard of RP. The character's personality is already established after all and it is painfully obvious when someone flubs it. 's why I shy away from the idea of using League Champions myself. And I simply have more fun fiddling with my own ideas. But some people would clearly rather use an existing League Champ and provided that there aren't fourteen Teemos in the same topic (or Move Quick-ing around the same continuity) everything should be just fine. Most people who drop into RP sub-forums only stick around for a handful of posts anyway. Give them a few days and there's a good chance they'll drop out again. Dozens of any one League Champion is a pretty unlikely scenario.
. Walking in going "This champ is mine now" aint gonna get you no where, and we really don't need mass confusion from duplicates. We are the blood of the RP forum but I've seen more original and most likely fun characters to RP as, whole point of RPing is to make a character and act as them, so we grabbed characters and now we act as them. How would you feel if you started RPing then I walked in and started RPing the same character, it would not be fun. Again, I'm not trying to be rude, but be careful with that sort of attitude. I've watched the rise and fall of many RP groups and placing one's self above other posters never ends well. Never ever ever ever. but I've seen more original and most likely fun characters to RP as, whole point of RPing is to make a character and act as them, so we grabbed characters and now we act as them. How would you feel if you started RPing then I walked in and started RPing the same character, it would not be fun. It can be downright hilarious, actually. Depending on how people roll with it. With Original Characters people tend to have much more invested in them. They are, after all, their own ideas given shape and personality. Taking another person's work without permission is plagiarism. The existing League Champions, however, are more or less public domain. I can totally understand being ill at ease over someone making another Ask Mundo thread considering that you already control the current one. Or even RPing more plot-focused thread as Mundo since I've seen you do so. But from the look of things are lot of the Champions from the various Ask threads aren't actually getting any plot-focused threads. Answering questions Formspring style is one thing, actually setting out to create a story with a group of other posters is quite another altogether. That's actually the great thing about us Ask people, we don't need to make any plot-focused threads - they make themselves. Things happen between us that eventually lead to making actual plot-central threads to continue our antics, like the recent "Face Off on Mount Targon." You need to stop and look before you start accusing us of anything. We are a very diverse group, and we have no reservations about interacting with Original Characters created by other users. Just spit it out, which champion you want, but is already taken? And I'm not interested in RPing any of the League Champions. I've never used an established canon characters in my RP before and I don't intend to start now. I'm merely speaking for those who would. What does it matter to you, then, if we roleplay champions? If you don't really care to portray one, then why even complain about it in the first place? And no, don't try to hide behind the "I'm speaking for others" excuse, because the only people that have a problem with the Champion portrayal restrictions are the ones who want to be one, but there's little we can do about that. Those who don't usually portray their own characters, either Summoners or unaffiliated people, and it works well enough. We of the Ask Threads have taken on the privilege of portraying champions who we either love or think are interesting, and we try our best to flesh out the champions while having them interact with the crazy characters out there that contribute something interesting. We play champions because we like them, or they're interesting. Only complaints are from those who want a taken champion. 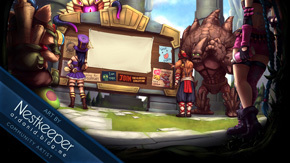 Roleplaying Forums are diverse enough that what champion is or isn't available doesn't matter. Doesn't matter to me one bit if you roleplay champions! I am totally open to people roleplaying whatever it is that they would enjoy. As outlined before, I'm only interested in seeing people having fun. What does matter to me is people being shouted down, downvoted, or otherwise bullied by others who have no actual power or authority to tell them that they can't RP a particular League Champ. What would be really nice is a Red's input on the matter. That would settle things quite soundly. All I'm saying, Rebonack, is that we, the Askers, have cultivated this entire roleplaying experience for a while. Then you come in, spouting your baseless accusations that we're somehow "elitist" when all we want is to be able to roleplay in peace. We can't do that if there's literally a dozen other people trying to be the same character, as it prevents us from making any champion-based progress. The reason we downvote or otherwise discourage others who try to play a champion is only because it would throw the Roleplay forum into chaos and there would be little, if any, consistency for anything. There would be a new Teemo, or Master Yi, or even Draven, every day or two and nobody would know which to follow as the aforementioned champion. And we only do that if it's from a user who's otherwise disrespecting us and the nature of the roleplaying forum in general.